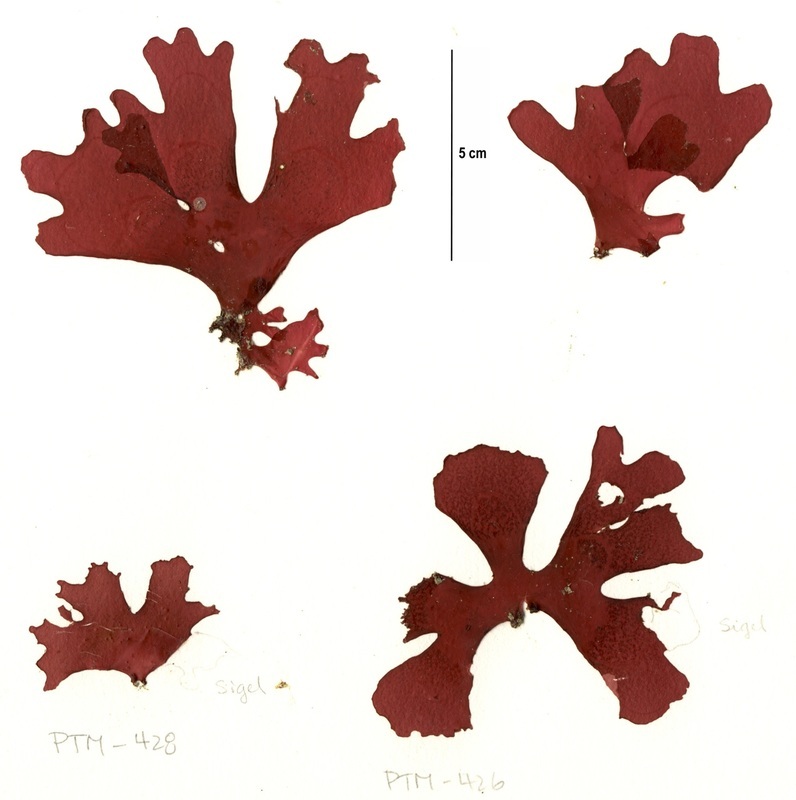 Top left: specimen collection number PTM 426 in the UBC Herbarium Algae Databse. Search the collection number in the database for more information on this specimen, or search the species for further occurrences. Image courtesy of Sandra Lindstrom. Top right: visible curved lines marking the thallus when held up to light is a key identifying feature of this species. This photo and bottom left photo by Jenn Burt. 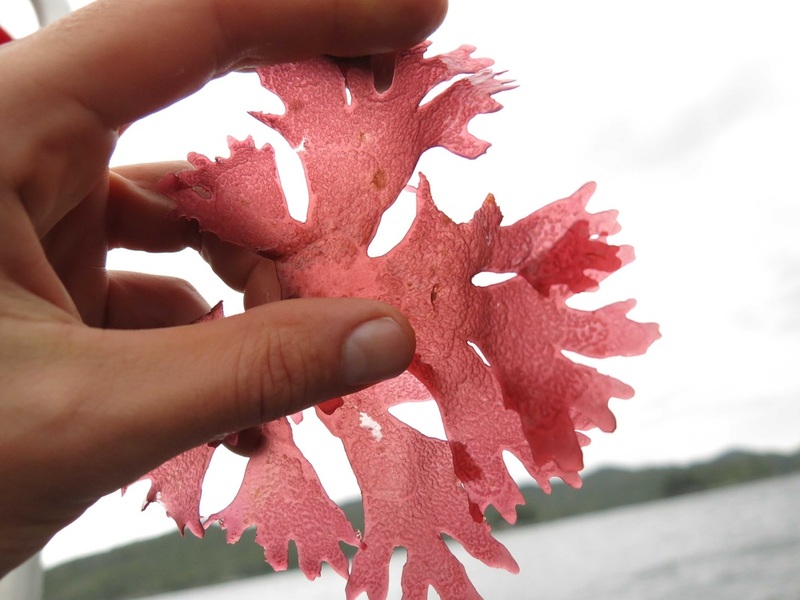 This red alga reaches 21 cm tall and is irregularly dichotomously branched. branches are about 1 cm wide and have rounded ends. Curved lines are visible across the thallus when this seaweed is held up to light: these lines are formed by divisions within the thallus. Arched red seaweed grows attached to rocks and tubeworms, and grows epiphytically on other algae. It is found in the subtidal to a depth of 25 m, and ranges from northern BC to Baja California, Mexico. 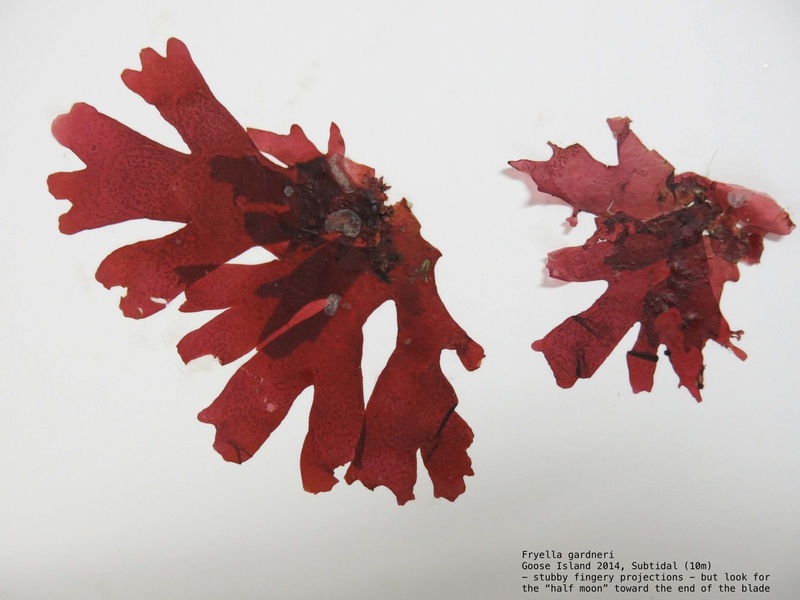 Rhodymenia pacifica and R. californica are similar but lack the internal divisions that form visible lines across the thallus of arched red seaweed. Specimens of arched red seaweed found in California have a blue iridescence. Watanabe, J. Fryeella gardneri Â (Setchell) Kylin. SeaNet. Stanford University Hopkins Marine Station, Pacific Grove, California. Accessed 30/04/2015.